Kristina Morrow will be teaching this class for us as she trained with Eleanor Burns to teach her techniques. 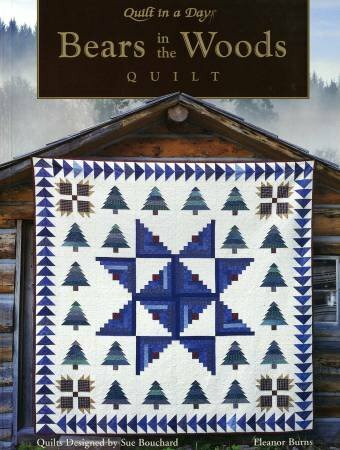 Whether using Civil War reproductions, batiks, grunge... this will be a favorite quilt in your home for years to come. This pattern is also a good scrap buster project. Remember that you will receive a 25% discount on the necessary fabrics and book for the project once you have paid your class fee. You must have a working knowledge of your sewing machine and be comfortable with cutting. Each student must have their own book, Bear In The Woods, by Eleanor Burns, for the class. No exceptions! You must provide fabrics for the quilt as they are not included in this class. Please come ON TIME and ready for fun, laughter and enjoyment. Kristina Morrow, a trained and certified Eleanor Burns instructor and a local quilter with a great reputation for making beautiful quilts. We know you will enjoy being a student in her class. This is the instructional fee. Pay for your class and get 25% off your book, supplies and fabrics for the project.